The 10 Best Summer Activities in Maine! After the snow melts and the kids are let out of school for the summer, Maine transforms. Sleepy little seaside villages remove the boards off their windows, teenagers start to scoop ice cream, the docks are put out in the lakes, and the tourists begin to come in droves. It’s summertime in Vacationland. Here are the 10 best summer activities to do in the state! Cadillac Mountain is a unique mountain on the coast of Maine. It’s the highest point within 25 miles of the shoreline on the entire North American continent and it’s also the first place in the country to see the sunrise. Whether you choose to hike, bike, or drive to the top of Cadillac Mountain, you don’t want to miss the sunrise. Nothing screams “Maine” more than eating a delightful lobster roll next to Maine’s most famous lighthouse with views of the Atlantic Ocean. It’s the perfect Instagram moment. Parked at Fort Williams Park in Cape Elizabeth, the Bite into Maine food truck serves up some of the best lobster rolls in the state. And, what better place to get them than in front of the most photographic lighthouse in the United States? Open 24 hours, 365 days of the year (yes, the doors really don’t have locks), L.L. Bean is Maine’s go-to shop for all your outdoor gear. With the summer months in high gear, you’ll need to stock up on camping, fishing, boating, and biking gear. When August comes around, you can even do you’re back-to-school shopping here. Don’t miss their summer concert series either! Don’t have a canoe? No, fret! Saco River Canoe & Kayak has the boat for you. 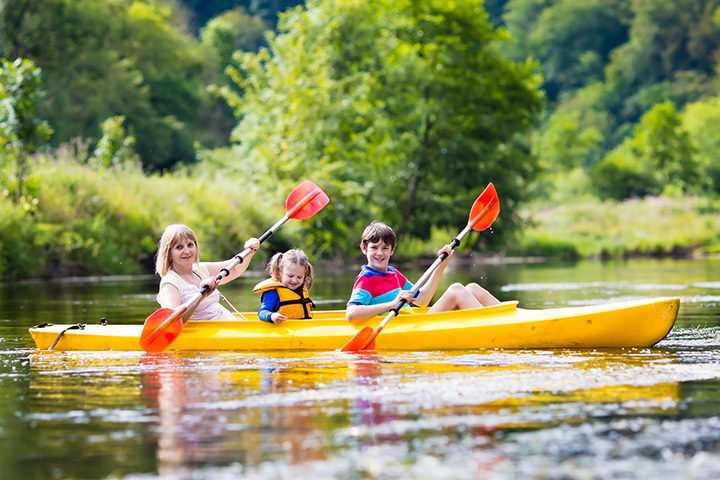 Gather up your closest friends and favorite beverages and head out for a weekend of canoeing and camping along the Saco River. The Saco River is a rather lazy river making it the perfect spot for a little relaxing paddle and a whole lot of laughs with your friends. If you’re looking for more of an adrenaline-pumping river, then you want to head to the West Forks for some white-water action. Three Rivers offers white water rafting on the Dead River, Kennebec River, and the Penobscot River. Grab some friends and be prepared for some serious thrills! Kick off summer in Maine with the annual Old Port Festival. Every June, the Portland community comes together for a day to celebrate music, art, and food. This family-friendly event offers live music, food and drink vendors, kids games and activities, and tons of street vendors. You can even take a ride on the Casco Bay Eye Ferris wheel! Every summer, thousands of Mainers and out-of-states flock to Baxter State Park to climb Maine’s tallest mountain. Standing at 5,267 feet, Mount Katahdin is the northern terminus of the Appalachian Mountains and one stellar hike. With several trails to the top, it takes between eight and 10 hours to hike this granite beauty. Once you get to the top, you’ll be rewarded with incredible views. Maine as a very long maritime history. What better way to experience a slice of it than sailing on an old schooner out of Camden Harbor? During the summer months, you can take a two-hour cruise along Maine’s rocky coastline on the Schooner Olad. Choose from morning, afternoon, or even sunset cruises. Maine is a camper’s paradise during the summer months. With hundreds of campgrounds across the state, grab your tent and your cooler and head to a campground near you or across the state. From coastal campgrounds with seaside views to secluded wooded campsites nestled in the pine forests of northern Maine, you’ll find the perfect spot for you to build your campfire to roast some s’mores!